My days have been packed with opportunities to partner with my fellow Miss Mustard Seed Milk Paint retailers in the southeaster PA area. I’ve been doing workshops and free demonstrations until my feet hurt and I honestly couldn’t be happier. with the people who do what you do? It seems counter-intuitive to help the businesses that offer the same products and services as your business, doesn’t it? Why would you lend your time to another store when it could be spent helping yourself? You see, in my mind, I feel it’s more important to build relationships and network with people that do what you do rather than ice them out and pretend they don’t exist. It’s more important to foster community over competition. Over the summer, I joined a group called The Rising Tide Society. It’s pretty fabulous. Their foundation is built on the concept that if creative businesses help one another instead of competing, then it will be beneficial to everyone. Think about it this way – if the economy and the marketplace is the ocean, and every business is a boat, then a rising tide would lift all the boats. What benefits one benefits all, whether directly or indirectly. To foster this sense of community, meetings are held every Tuesday night in various locations where creatives gather to learn hard skills like social media, marketing, networking, etc. and connections are made. They’re called “Tuesdays Together”. 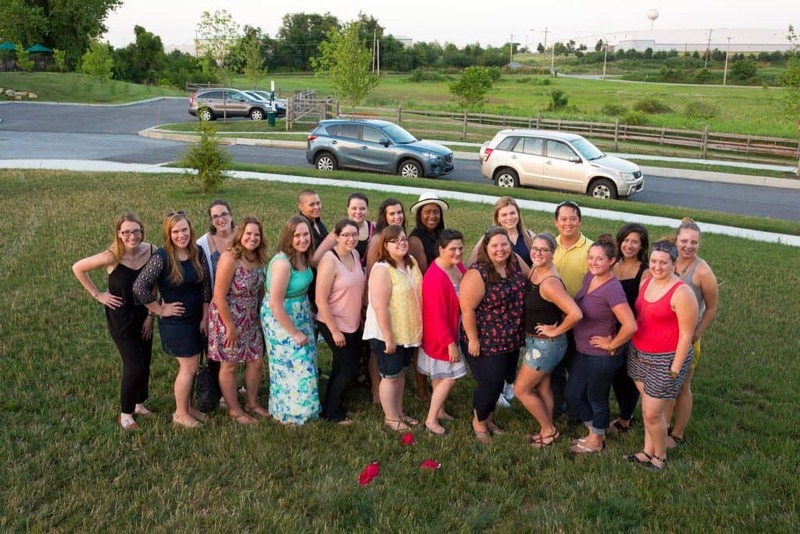 There’s a group that meets near me, and over the summer, I was able to attend frequently. I’m 4th in from the left in the pink paisley dress. I haven’t been able to attend meetings since the summer because I have a regular commitment on Tuesday nights. The concept has stuck with me though, and I made it my goal to network more than I nitpick. 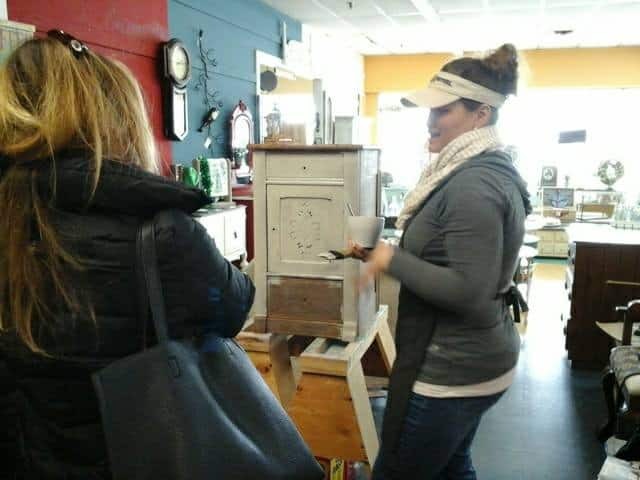 On Wednesday, I had the pleasure of teaching a Milk Paint 101 Workshop at Blue Dandelion by Tiffany. There were two participants that signed up but one had to cancel unexpectedly (but for a fantastic reason). There was a new baby in her family, so that obviously trumped Milk Paint! It wound up being a one-on-one session and both my “student” and I really enjoyed ourselves. We went slow and she was able to ask as many questions as she wanted. I walked her around the shop and was able to find gorgeous pieces and examples of all sorts of techniques. I dumped all of my tricks and techniques on her eager mind and she left feeling completely confident and inspired to use Milk Paint. 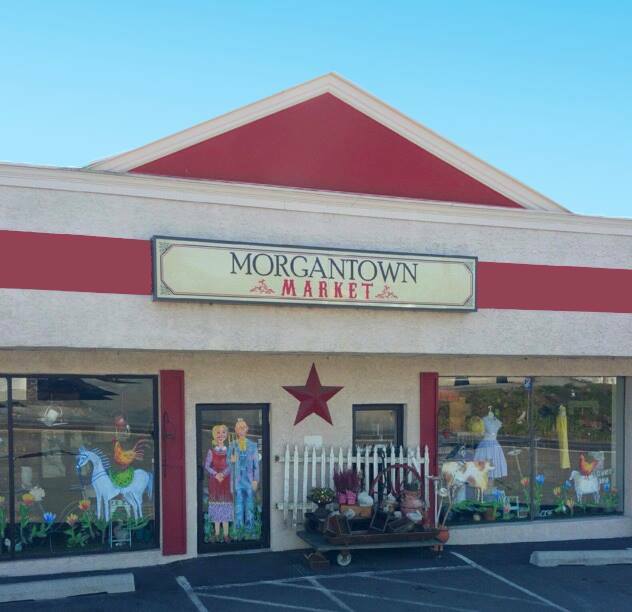 On Saturday, I spent my afternoon doing a free Milk Paint demo at my usual stop,Morgantown Market. We had scheduled a 101 Milk Paint Workshop but we didn’t have any takers. I’m learning that’s normal every now and then. You’ll schedule a workshop and no one signs up. We decided to do a free demo instead as people were shopping. I made a Farmhouse Clock out of a round table top. Didn’t it turn out SO well?!?! I’m so happy with it! I mixed up equal parts Curio and Typewriter (about 2 tablespoons of each) with 2 parts water. Typically I mix up my Milk Paint in a 1:1 ratio, but I wanted this batch to be more of a stain than full strength. So I did a 2:1 ratio – two parts water and one part paint. 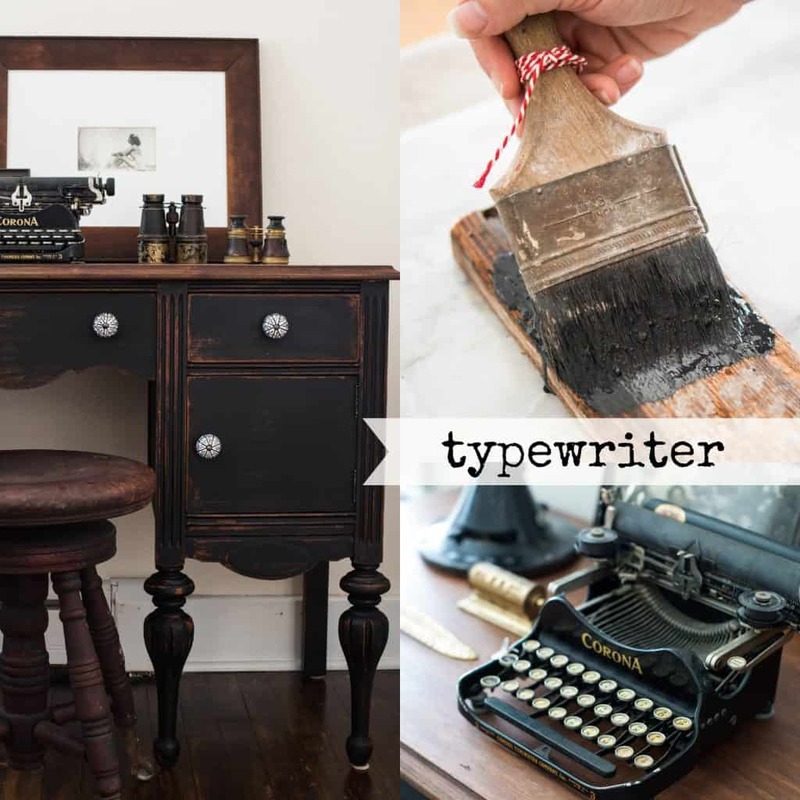 Mixing some Typewriter in with Curio makes for a rich dark color that looks simply divine on raw wood. I used a clock stencil for the numbers and I used Farmhouse White for that part. It’s 24″ wide, so it’s a good sized clock for your home. Unfortunately, I still have some troubleshooting to do with the hands and the battery box that goes on the back. The clock shaft was too small and I couldn’t screw the handles on properly. Plus, I couldn’t figure out to attach the battery box to the back. There aren’t any screw holes, so I was kind of stuck. I didn’t anticipate that would be an issue, but I’m getting suggestions and ideas from other Milk Paint retailers who have done this before. Their ideas are super helpful and I think it’s going to turn out just fine. There’s that whole community thing again . 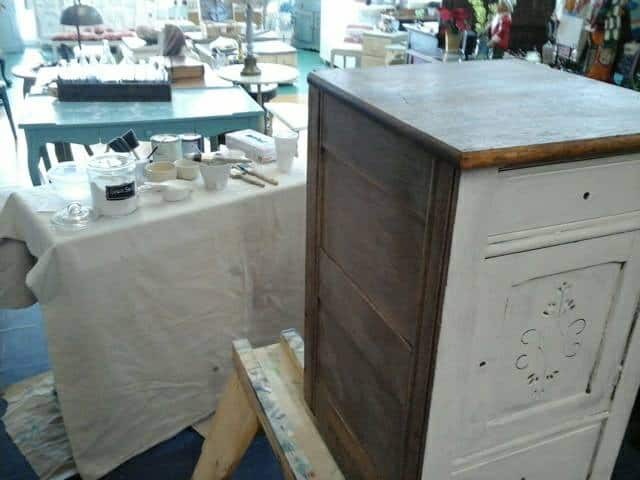 . .
On Sunday (today), I spent my afternoon at Consign-It Furniture in Kennett Square doing another free Milk Paint demonstration. 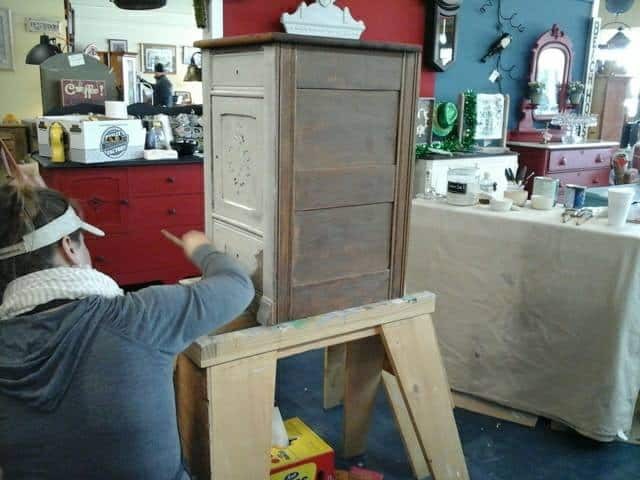 My painting subject was a cute little wood washstand/nightstand/end table that I picked up during my last trip to Mustard Seed Studio. 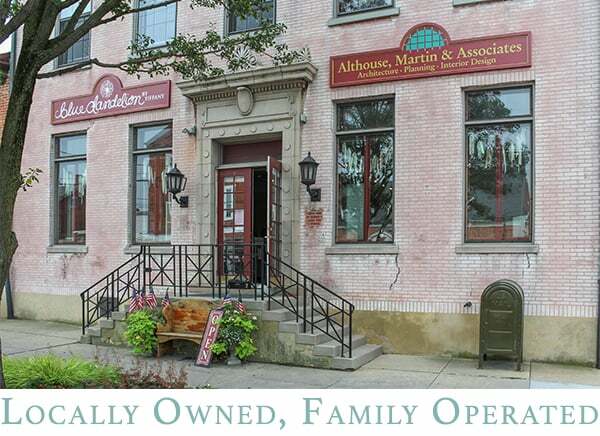 There are a handful of antique stores on the way to Marian’s studio in Biglerville, and I like spending a day hitting them when I’m out that way in central Pennsylvania. I picked this one up at Black Rose Antiques in Hanover. 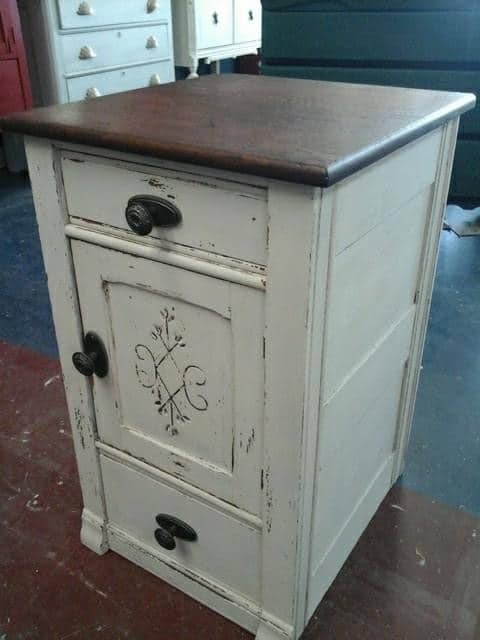 I thought it would look amazing in Milk Paint (and I was right)! Plus, the price was incredible so it quickly made its way into the back of The Marshmallow (my white truck). I also scuffed the bottom using 60 grit sandpaper. The finish that was on the piece was a shiny yet tired and very worn polyurethane. If I Milk Painted it as it was, it would have chipped horribly. I’ll do a post more about the scuffing process because I got a LOT of questions about the prep work needed to use Milk Paint today. I decided to use the color Grain Sack on this piece because I thought it would look fantastic with a dark wood top. A huge thank you goes out on my end to the staff at Consign-It. They set me up with a cozy spot to paint, handed me products as I was talking about them with customers, and took pictures for me! Plus, they had coffee which put me over the top with gratitude. This is the first coat going on. I think this photo was blurry because, like most women, I talk with my hands! This piece isn’t 100% finished but we put some knobs on it so you could see what it will look like once it’s all done. Uh-Door-Ah-Bull, right? I decided to keep this cutie pie and it’s now serving as Marc’s new nightstand. It’s rare that I wind up keeping a piece that I bought, but this little guy fit the bill perfectly. Marc’s old nightstand has now become a new project! There were a good number of shoppers that stopped by to ask questions as I was painting. 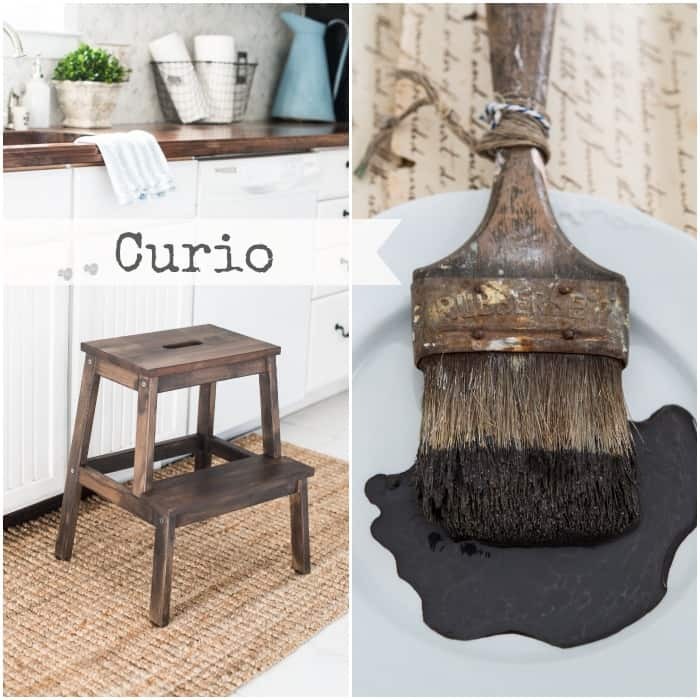 Almost everyone wanted to know what the difference is between…you guessed it…Milk Paint and Chalk Paint. I’ve covered that topic here. Others were curious about the painting process in general. What do you do first, second, third? 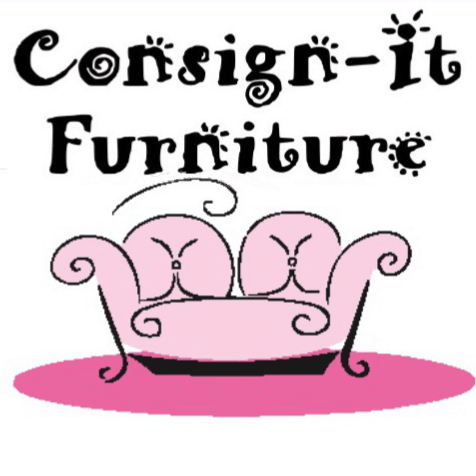 Each question gave me ideas for blog posts, so you can thank Consign-It’s shoppers in advance for my next few posts! Every time I partner with local businesses, I smile. Every question, customer, curious onlooker, and passionate furniture painter that comes my way fills my soul. I’m truly doing what I love and as exhausting as it can get (which is has been as of late), I know that I’m exactly where I should be, doing what I should be doing, with the people I should be doing it with. I encourage you, as far as it is within your power, to build strong connections with the businesses around you. Ask questions. Offer to help. Seek opportunities to partner. Tag them on social media. Like and share their posts. Comment. Encourage. The painted furniture world can be extremely cutthroat and catty, but it doesn’t have to be. I challenge you to be different. Be an encouragement and a supporter rather than an enabler and a scrutinizer. Spread the love and embrace community over competition.